That was a close one. | Carnahan & Sons, Inc.
We just dodged another bullet this week. 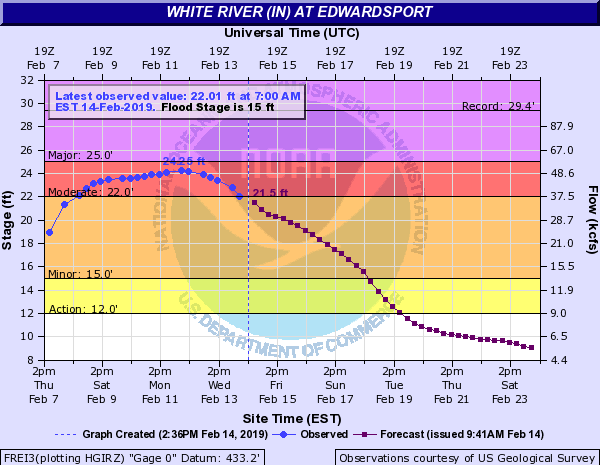 The West Fork of White River crested at 24.25 feet at Edwardsport early in the week. It is now falling slowly. That 24+foot river strongly tested our levee at the Nellie farm… one that we just re-built after last fall’s harvest. So, it stood this first test! Here is the White River report for today. This is from the reporting station at Edwardsport, here in SWIN. Our fields along US 50 are about 1 day’s flow below Edwardsport. Brandon took some soybeans to Newburgh today, and John has had the MX290 through the shop. The tractors are now ready for spring! 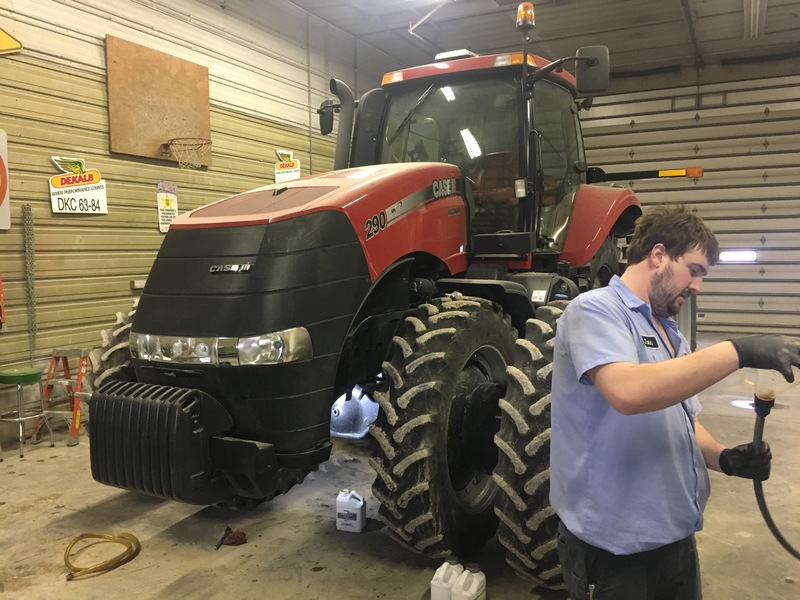 The MX290 Magnum tractor received a thorough servicing yesterday and today. 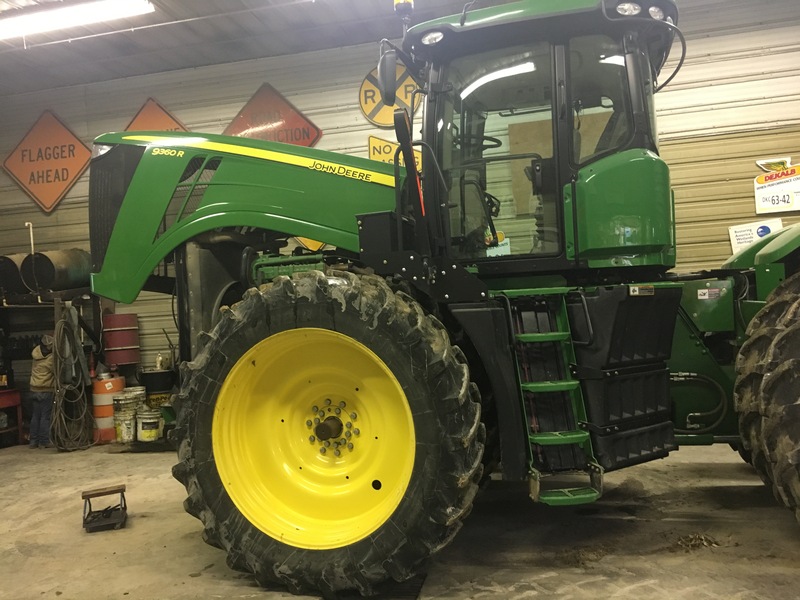 The 9360R was given the full service treatment on Tuesday and Wednesday. It is warm and windy out there today. The sun peeks through every now and then. Right now, the temperature stands at 56F (13C). The wind is quite strong at 17 mph, with gusts to 25. Gets your attention! We are told it will go below freezing again tonight, with some snow. Oh, boy! HS BB season is winding down here in Indiana. The girls’ tournament is in the 3rd of 4 weekends of play, and the boys’ have about 2 weeks left on the regular season. Wow, that went fast. Next week, we will attend a training session about the Climate.com information system called FieldView. They are calling it a ‘refresher’,but there will be some new things to learn. Seems like the utility of this system keeps improving. This entry was posted in Family Life, Farm Days, News and tagged CIH MX290 tractor, Climate Corp, Edwardsport river forecast, FieldView, JD 9360R tractor, NFMS, White River. Bookmark the permalink.